FSQ is sufficiently robust that it works very effectively as a Directed Messaging (Selective Calling) system. The FSQCall Directed Messaging mode offers a series of useful commands that the transmitting station can send, usually manually, and which the receiving station can respond to automatically. One of the unusual functions provided is the ability to transmit and automatically receive - and even to request - digitally managed analogue images! Analogue image techniques are used because they are much faster and less error prone than digital techniques. Image transmission in FSQ is very versatile, with two colour ima image sizes: higher and lower resolution, and a black-and-white very high resolution mode. The final image mode is a very high resolution black-and-white mode (like a FAX mode), ideal for sending documents. All modes are received automatically since they are managed using FSQ mode digital commands. Thus there are three sizes of images. No matter what size the original image, or the mode used to transmit and receive it, when they are displayed, they are always shown (enlarged or reduced as necessary) at 640 x 480 pixels, in a floating window. Enlargement is achieved by interpolation, which gives excellent image appearance. Actual size 320 x 240 pixel image. The above image was received over the air under ideal conditions - image quality is remarkable given the modest resolution. 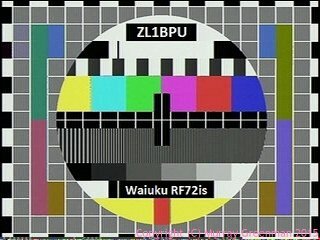 The modulation is similar to SSTV, i.e. it is analogue FM modulation, but that is where the similarity ends. The FSQ image modes use only 400 Hz bandwidth (similar to FSQ digital transmissions), and like FSQ, there is no synchronization transmitted. The ITU Emission Designator for the image mode is 400HF3C. The start of the image is signalled digitally (i.e using FSQ), and the receiver simply captures data continuously for L lines of P pixels, resulting in a (L x P) pixel image, then reception stops. Each line in a colour image is sent three times, for red, green and blue components. The duration of transmission is (L x P)/400 seconds for colour, and (L x P)/1200 for B&W. The images are always sent in 4:3 landscape aspect ratio. Images are best sent and received in FSQCall mode, since then reception is automatic. Images can be sent to one recipient, to several recipients, or everyone on the channel, just as with other messages. Images can be sent and received in non-directed chat mode, but reception will need to be started manually. Note: While transmitting or receiving images, it is most important that you refrain from typing in the TX buffer, moving windows around, realigning images and even looking for or opening other files. These interrupt-driven actions can incur delays, which are likely to disrupt transmission and reception. It's also not a good idea to do these things while transmitting text. FSQ Image Mode was designed (like FSQ) for NVIS propagation on the lower bands, quite different from the intentions of SSTV. 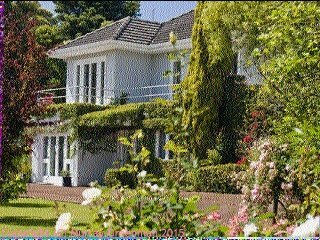 Unlike SSTV, the images are sent relatively slowly, in a narrow bandwidth (&frac13; of SSTV), and as a result the image signal to noise ratio is generally better than SSTV for the same transmission power. As a guideline, FSQ signals (before the image is started) need to be about +10dB SNR for noise-free image reception, although quite adequate images may be received at or below 0dB if fading is limited. FSQ images also offer significantly better reception than SSTV under NVIS conditions. Because there is no image sync, there is no risk of the image tearing due to timing changes, or breaking up during selective fades. All that happens is that the image may noise up momentarily, but will stay correctly aligned, as in the first example below. Note that there is no hint of image break-up or tearing of the image in any of these examples, even with fading, and also no sign of multi-path ghosting. 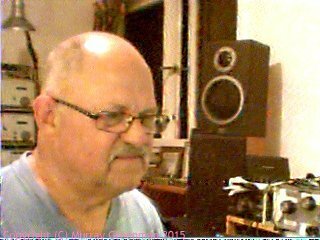 These images were all transmitted over a range of 300 km using a 15W transmitter. (1) 80m at night, with fades; (2) Live webcam shot of ZL1BPU, 80m at night (3) 40m daytime. The image mode sampling rate is 12,000 samples/sec, the same as the text mode. Each pixel consists of 10 samples, and there are 640/320/160 pixels/line. Therefore the line period is 0.5333/0.2667/0.1333 seconds, or 1.875/3.75/7.5 lines/sec. 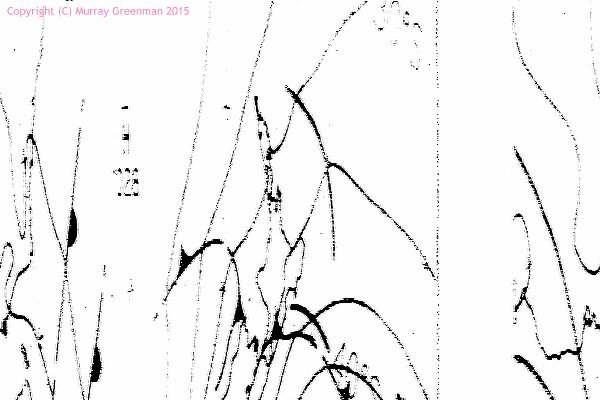 Each line is sent three times (except in B&W FAX mode), in RGB order. Image transmission duration is given in the table above. Images in portrait mode can be transmitted by rotating them before transmission, and rotating back after reception. Rotation is external to the FSQCall program (Windows Photo Viewer will rotate and save images). Original photographs of any size can be selected, and will be resampled automatically down to the appropriate size for transmission. A4 documents to be sent in FAX mode should be rotated to landscape format before transmission and returned to correct orientation again after reception. As mentioned, there is no horizontal (line) sync sent with the image, and no vertical sync during or at the start of the image. As a result, it is possible for reception to start slightly earlier or later than the standard delay from the time of the command, depending on the relative speed of the computers used at either end. This has two main effects: first, the image may be recorded shifted left or right, and the pixel order (in colour mode) may be wrong. This is easily fixed after reception using the Phase control. If the sound cards in the transmitting and receiving computers differ markedly in sample rate, the resulting image can be skewed. A timing difference of 24ppm is enough to cause a just noticeable (one pixel) slant. This is easily fixed after reception using the Slant control. High quality sound cards should be better than 5ppm, resulting in imperceptable slant, but some cheaper computer built-in sound modules and dongles may be rather worse. You will be pleased to know that reception is completely automatic. Provided the software at both stations is in FSQCall mode, and the sending station uses the correct callsign and trigger command, the receiving program will identify the image start, and record the image. In doing so, it automatically opens the floating 'Receive Image' window. You can also open this manually using the Image/Receive Image... command from the Menu. If the transmitting station goes off the air or reception is lost during recording of a image, the recording will continue until the necessary number of samples have been made before reception stops or the receiving operator stops reception. Digital reception continues during image reception, which means that if the transmitting station stops for some reason and starts image transmission again, the image reception will restart, even if you've not stopped it. The Phase control adjusts phase (small movement) and colour order (larger movement). Very small movements can be made by clicking on the slider track to the left or right of the slider. Adjust so the sides of the image match the frame, and sky colours are blue, grass is green, skin tones are pink or brown! The Slant control adjusts for differences in sound card clock rates. Use this control to correct any slight tilt of the image. Again, very small movements can be made by clicking on the slider track to the left or right of the slider. This control has a huge range, to accomodate received images from stations with very badly calibrated sound cards. Use these adjustments before saving the image. Adjustment may be a little slow on older computers. First correct the Phase (correct it at the top of the image if there is significant slant), then correct the slant. Finally recheck the Phase if necessary, and then save the image. You should also not type in the TX pane, access files or documents, or prepare an image for transmission, while a image is being received or transmitted. You risk having the image shift irretrievably sideways part way through reception. 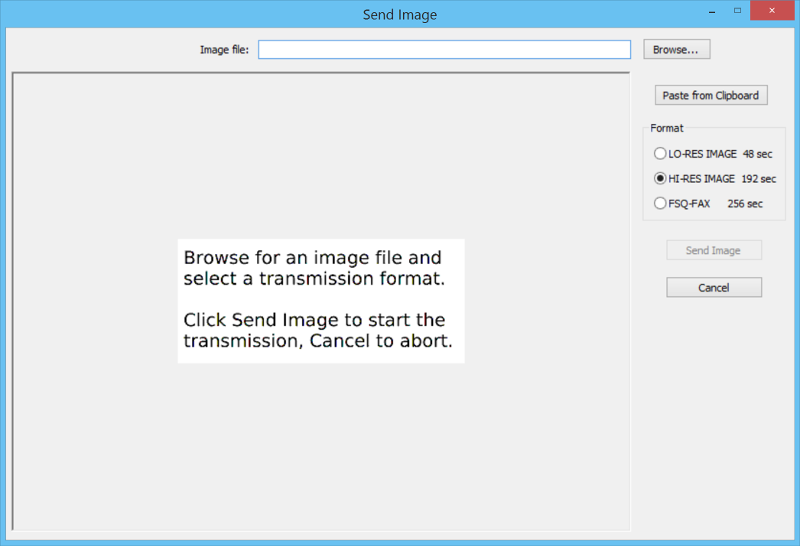 However, images will still start automatically (in Directed Mode) if you already have text in the Transmit Pane. It's not wise however, to continue typing while an image is being received, as this may trigger timing shifts on slower computers. 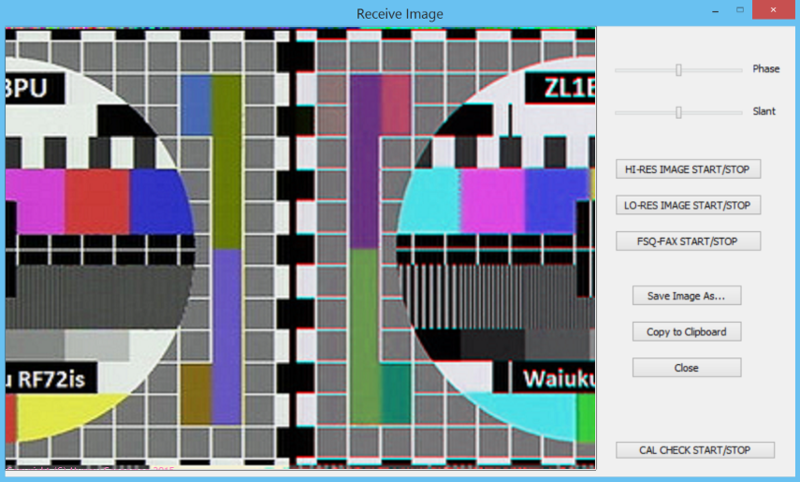 When the Receive Image window is opened manually, there are three mode controls: the HI-RES START/STOP, LO-RES PIC START/STOP and the FSQ-FAX START/STOP buttons. These all function in the same way. It is handy to be able to start image reception manually if the receive command failed, or your or the other guy's FSQ program is not in Directed Message mode, or if you want to receive a image not directed to you. You will need to know from the transmitted header (watch the Monitor pane) which type of reception to start. The command will be followed by a 'L' (large, higher resolution) 'S' (small, lower resolution), or 'F' (B&W FAX mode). If you mistakenly receive a low resolution image as high resolution, wait until the transmission has stopped, then press the LO-RES PIC Start/Stop button, and the image will be displayed correctly in LO-RES mode. The reverse situation is not fully recoverable, as reception will stop before the complete image has been received. In this case it's best to start recording again. Either right-click on the image and choose Save Image As... or click the Save Image As...button in the Receive Image window. These actions bring up a file 'Save As' dialog. Either right-click on the image and choose Copy or click the Copy to Clipboard button in the Receive Image window. 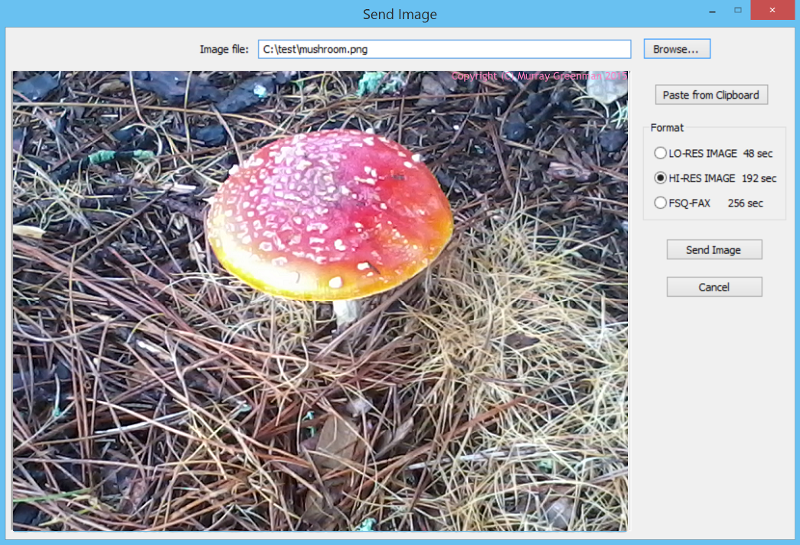 This lets you to copy a received image and paste it into another application such as Paint, or into an email message. But look closely! You should be able to see that some of the lines at least are vertical, or near vertical. There is often a strong black vertical bar (in this example a white space) which would be at the edge of the original image. To some extent results depend on the transmitted image content, but the vertical lines will be consistently dead vertical if your sound card calibration is correct. WEFAX transmissions have very high timing accuracy. By the way, some sound cards have different sample rates for input and output, and this check does not necessarily give an indication of the transmit sample rate accuracy. It is not possible to compensate for the error in the software, other than by using the Slant control. This feature is intended only for calibration check purposes. It is not intended for WEFAX reception. FLDIGI has an excellent automatic WEFAX reception mode. Then from the Menu, select Image/Send Image.... This will open a floating 'Send Image' window. Shortcut: To send an image file to a station in the heard list, left-click to select the call and then right-click to open the shortcut menu. Choose Send Image To... (%) to open the 'Send Image' window. The callign and trigger will be automatically placed in the TX pane. The transmit time is shown for each. To load an image from a file, either right-click on the image and choose Load Image File... or click the Browse...button to bring up a file 'Open' dialog. Select an image, and click Open. All common image types are supported, in any size. When you click Open, the program will resample your image down (or up) to the appropriate size, and display it. Images not in 4:3 aspect ratio will be squeezed to fit, and will need correction at the receive end. 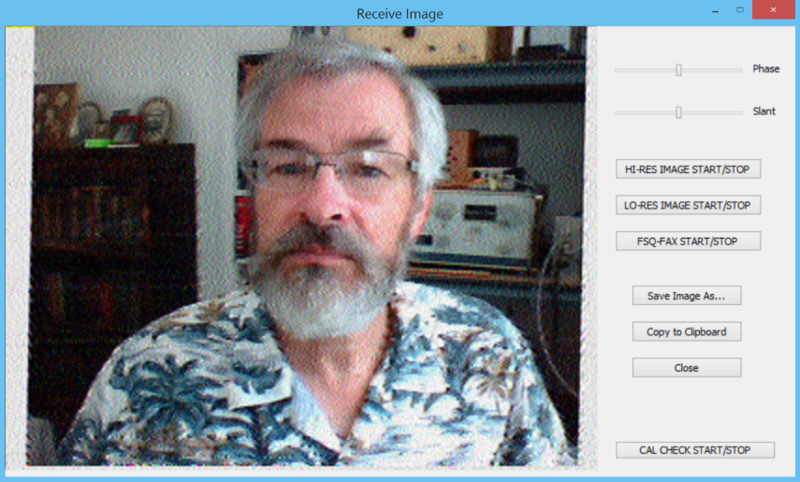 Portait mode images should first be rotated left before transmission, or converted to landscape mode using an image editor, as in the 'QSL Card' example below. You can also paste an image from the Clipboard. Either right-click on the image and choose Paste or click the Paste from Clipboard button. This lets you to copy an image from an application such as Paint or a web browser and paste it in the Send Image window for transmission. Once the image has loaded, you can, if you wish, revise the size you wish to send. Finally, check that you've typed the correct direction and trigger in the TX pane, then, if the channel is clear, click the Send Image button, and the image transmission will start. For the first few seconds, the image reception command will be sent, followed by the image. 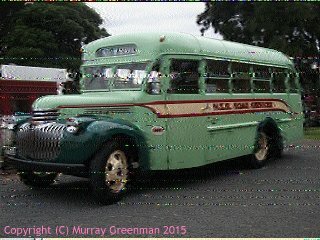 The progress of transmission can be followed, as the program places a green progress bar down the right side of the image on the Send Image window. When the image transmission has completed, the program reverts to receive. Don't fiddle with anything else on the computer until this happens. Note: The recipient callsign for image transmission can be a single callsign, such as zl2abc%, a list of callsigns (such as zl2abc% zl2cde% zl3fab%), and even allcall% can be used to send the image to everyone. The procedure is exactly the same as described above, except you select FSQ-FAX mode. The image must be in landscape format, and can be in colour, although it will be converted to B&W for transmission.